Salandit in game: 1,857 Who? Important notice! Pokemon Salandit is a fictional character of humans. Salandit (Japanese: ????? Yatomori) is a dual-type Poison/Fire Pokémon introduced in Generation VII. 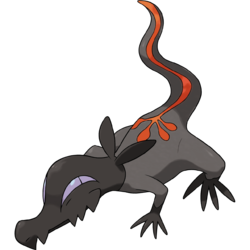 Salandit is a small, black Pokémon resembling a salamander or lizard. Its body is dark gray with a black head and feet. Along its back and down its tail is an orange-red line. This marking splits into short lines with round tips on its back. This line sometimes flares up when it attacks. At the base of its neck are two short, flat spines. Its eyes are light purple with slit pupils and there are several tooth-like protrusions along its upper jaw. Each foot has four pointed toes. From the base of its tail, Salandit can emit both a toxic gas and flames. The gas has a sweet odor that causes dizziness. The female can also release pheromones that attract males of all species, including humans. Additionally, these pheromones may cause opponents to be controlled by this Pokémon's will. While it is not a powerful Pokémon, it is able to unbalance opponents with its cunning techniques. Three Salandit appeared in Alola to New Adventure! under the ownership of a Team Skull Grunt. One of them reappeared in SM011. A Salandit appeared in SM008. A pair of Team Skull Grunts send out two Salandit to scout the area, to make sure Sun had cleared out the area of Pyukumuku. As the female grunt secretly places one, Moon sees this and out of malice, one of the Salandit is ordered to attack her. However both are easily dispatched by Sun's Meowth. Salandit appears to be based on a salamander, some species of which are toxic. It may draw specific inspiration from the Japanese fire belly newt, which has similar coloration to Salandit. In legends, salamanders are also commonly associated with fire and in some cases poisons. It also shares some similarities to lizards. Yatomori may be a combination of ?? yato (burglar) and ?? imori (newt).